MEXICO CITY A study released Wednesday by a respected Mexican think tank contends that proposals to legalize the recreational use of marijuana in Colorado, Oregon and Washington could cut Mexican drug cartels' earnings from traffic to the U.S. by as much as 30 percent. Opponents questioned some of the study's assumptions, saying the proposals could also offer new opportunities for cartels to operate inside the U.S. and replace any profit lost to a drop in international smuggling. The ballot measures to be decided on Nov. 6 would allow adults to possess small amounts of pot under a regimen of state regulation and taxation. Polls have shown tight races in Washington and Colorado, with Washington's measure appearing to have the best chance of passing. Oregon's measure, which would impose the fewest regulations, does not appear likely to pass. 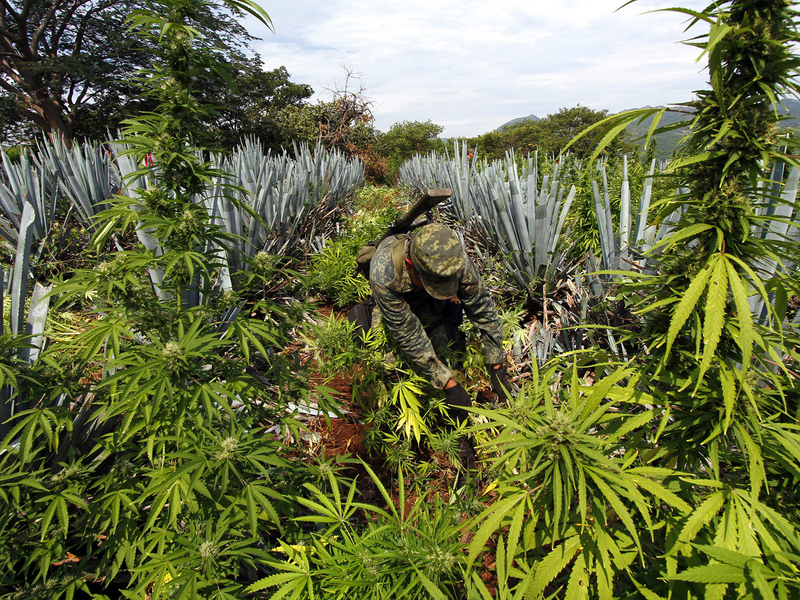 The study by the Mexican Competitiveness Institute, "If Our Neighbors Legalize," assumes that legalization in any state would allow growers there to produce marijuana relatively cheaply and create an illicit flow to other states, where the drug could be made available at cheaper prices and higher quality than Mexican marijuana smuggled across the international border. The report, based on previous studies by U.S. experts including those at the RAND Corporation, assumes that Mexican cartels earn more than $6 billion a year from drug smuggling to the U.S. It calculates the hypothetical, post-legalization price of marijuana produced in Oregon, Washington and Colorado and sold within those states and smuggled to other states. It then assumes that purchasers around the U.S. will choose domestic marijuana when it is sold cheaper than the current price of Mexican marijuana. That choice will lead to a loss of $1.425 billion to the cartels if Colorado legalizes, $1.372 billion if Washington approves the ballot measure, and $1.839 billion if Oregon votes yes, the study says. It only looks at the effects of legalization in individual states, and does not calculate what would happen if more than one legalized marijuana. Opponents of the ballot measures said the study bolsters one of their principal objections, that it will turn any state with legal marijuana into a producer for the rest of the country. They said, however, that they did not believe that production will rob the cartels of significant profits, saying instead that they thought Mexican drug lords would instead try to participate in legal production inside the U.S.
"If I were a cartel member and I knew Colorado and Washington had it legal, I'd get a couple front people and do my business out of those states. Why would I not?" said Thomas J. Gorman, head of the Rocky Mountain High-Intensity Drug Trafficking Area, a government agency that coordinates anti-drug efforts by local, state and federal agencies in four Western states. The Mexican government has said that drug legalization in some U.S. states could make it harder to prosecute growers and dealers in Mexico, because they would be producing a product potentially destined for a place where it is legal. Alejandro Hope, an author of the study and a former high-ranking officer in Mexico's domestic intelligence service, acknowledged that the study made a series of assumptions that may not be prove to be true, including the assumption that the U.S. federal government would not aggressively investigate and prosecute movement of marijuana out of a state where it's legal. A post-legalization federal crackdown could make domestically grown marijuana uncompetitive with Mexican pot in many states, he said, meaning cartels would see less of a cut in profits. "Diversion is a problem we'll continue to have to monitor," said Alison Holcomb, campaign manager with New Approach Washington, the group pushing Washington state's legalization measure. "But the question is to the extent that is happening, is it better that the money is going to licensed, regulated businesses instead of going to Mexico?" A RAND study of a proposal to legalize marijuana in California in 2010 asserted that could cut cartel drug income by 20 percent.